Ahmedabad, BJP chief Amit Shah Tuesday visited the famous Lord Jagannath temple here with his family members and also reviewed the progress of an upcoming cricket stadium in Motera area. Shah, who has been in his home state since Monday, visited the Jagannath temple in Jamalpur area of the city and performed ‘puja’. “On the auspicious occasion of Makar Sankranti, Shah and his family members performed ‘puja’ at the temple. They also offered grass to a cow and gifted clothes to seers. 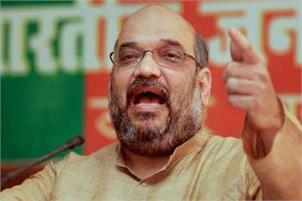 Shah visits the temple during Makar Sankranti every year,” temple trustee Mahendra Jha said. From the temple, Shah went to Motera area in the city, where the Gujarat Cricket Association (GCA), headed by him, is constructing a new cricket stadium. He reviewed the progress of the facility, which is being touted as the “world’s biggest cricket stadium” once completed. The foundation stone for this stadium was laid in January 2017. “Shah, accompanied by GCA vice president Parimal Nathwani, reviewed the ongoing work at the stadium during their visit today,” a GCA office-bearer said. On Monday, Shah celebrated the festival of Makar Sankranti, known as Uttarayan in Gujarat, by flying kites with partymen on the terrace of a house in Vadaj area of the city.